We offer direct access to the widest range of first-class steel products from mills across the EU and worldwide. Our stockholding facilities and distribution fleet are unrivalled, ensuring our customers can rely on us for timely and efficient delivery of their requirements. Coen Steel has a culture of expertise and innovation, both in terms of product and practice, and operates a quality system that complies fully with BS EN ISO 9001. Our CARES certification provides further confidence to our customers in the quality and reliability of our steel products and services. First-class stock holding facilities and distribution fleet. We are consistently competitive over a 12-month period. Our efficient services provide added value to our customers. All our construction steel products are CARES certified. We accept cutting and bending schedules generated by the world-leading aSa software. Strenx Performance Steel – available from 600 to 1300 MPA. 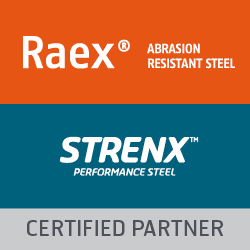 Raex steel can be exposed to extremely abrasive wear and tear. We source and hold the most extensive range of standard and specialised premium-grade mild steel plates. Laser steel is a flat, clean steel which has guaranteed flatness before and after cutting. Coen Steel stock a range of different types of grating systems. Cor-Ten has anti-corrosive properties, which reduces the requirement for maintenance and corrosion-prevention treatment. We cater for a wide range of stainless steel requirements.